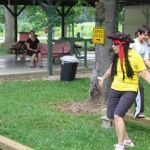 Ask fellow campers about "Butler / Mohican KOA" and nearby attractions. We were traveling along I-71 and needed to break the journey for 1 night. While this KOA is nice, it was quite a distance from the interstate, along small roads, and not as convenient as we had hoped, but that is certainly our fault! The campground is set in a beautifully forested area, and we enjoyed walking the camping loops. I would love to return and spend longer exploring the area. We camped at Butler / Mohican KOA in a Travel Trailer. Nice campground if you want an in the woods experience, it is a rural area. No cable tv or over the air channels. Bathrooms and showers were clean, the pool was nice, not much in the store but there is a Family Dollar store about 10 minutes away. Had good internet service from my Sprint phone. Owner was very friendly. When we arrived, our site had full sun. My wife asked to be moved and the owner put us in a shadier site. We camped at Butler / Mohican KOA in a Motorhome. Camped in a 35 foot fifth wheel on site 112. Led to site. Site long enough for rig & truck. Across lane from woods & non-awning side of site is distant from neighbor, & grassy. Some well trimmed trees provide shade. Required one board to level. Site is large, clean stone with grass, nice picnic table. No AT&T cell coverage (outside park & up road got coverage), slow WiFi, six antenna TV channels. Very quiet & dark at night. Restrooms well maintained. Did not use pool, but looked clean. Nice walking areas in woods & around large campground. Large playground, basketball & volleyball courts, horseshoes, miniature golf, fishing ponds. Ohio route 97 from Interstate 71 is rather narrow & is well marked. Watch for Bunker Hill street sign past Butler village. Campground is on the right if coming from route 97. We camped at Butler / Mohican KOA in a Fifth Wheel. We've stayed here 5 years in a row for Memorial Day. Our grandkids live nearby and this is how we start our summer. There are great activities for the kids. They especially like the water balloon fights with the antique fire truck. I love the Amish couple that brings food to sell. We will keep going back. Bev and Tom do a great job! We camped at Butler / Mohican KOA in a Travel Trailer. Halloween themed weekend. Several activities planned (pumpkin carving, costume contest, haunted hayride and haunted house). Costume contest was very disorganized and rigged since the winners were all same family. Haunted House and Hayride was fun and pretty scary. Had a backin site in the 90's, which were gravel and it sloped up hill more than one could really level out properly. This area is really nice part of Ohio and the campground is well maintained. Roads to the campground are a little winding and rolling so you have to use caution getting to this one...especially if you arrive at night. We camped at Butler / Mohican KOA in a Travel Trailer. We were here with 2 other families for Memorial Day weekend. I was a little concerned about camping on the holiday weekend as we have had bad experiences other places. The owners have their home in the campground and must have kept a watch over things. Quiet hours were observed in the loop we were in, and we observed no problem campers the whole weekend. There were many activities for the children, which they greatly enjoyed. The sites we were in were large enough for us to congregate in and the children to play. The owners were very accommodating for the few special requests we had. The upper loops have a rest room facility with 2 family rooms- toilet, sink and shower. They were clean when we used them. Everyone liked it so well that we plan to make this an annual event. The were only a few negatives. The road to the campground is a little narrow and there is an intersection just north of the campground where visibility both direction is a problem. They are far enough out in the country that the internet is slow. Not their fault, but it just is. We have no problem recommending this campground and plan to camp here again. We camped at Butler / Mohican KOA in a Travel Trailer. Great KOA! One of the best I've been to! 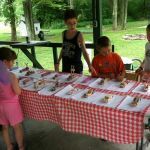 Great activities for kids as well as adults. Staff was great! Restrooms were very clean. They even have family restrooms, those are great. The only downside was that the Wi-Fi was spotty and if you have AT&T then you won't have cell service. Other than that, it was a great campground. We camped at Butler / Mohican KOA in a Tent Trailer. We stayed here over July 4th weekend, three nights, on our Travel Trailer's maiden voyage. We had two adults, two children (15 and 11) a dog and a cat. We stayed at site 116, which is a full-hookup, pull-through site. It might be the largest site on the property. That is good, except it seemed inviting to the neighboring children to play catch at our site. No harm, but mildly annoying. Most sites seem to have shade. The hosts were VERY nice. The bathrooms near our site were clean, large and modern. That is where we showered. We were very happy with them. It was a very pleasant campground with activities for children and a nice pool. The camp store is very limited. People seemed to respect the quiet hours. I was a little put off that there was a charge to use the new water slide. The staff helped us reserve tubes at a local livery shop. That was really nice, as our phones didn't work out there. We would definitely stay again. We camped at Butler / Mohican KOA in a Travel Trailer. Overall our stay was really nice. We had a back-in water/electric site (90) that was very private and wooded, but not level at all. If you are looking for a private site that is very nice with full hookups choose site 80. The lake/pond is nice for fishing, no swimming. The activities for the kids are well planned out: crafts, scavenger hunts, buried treasure hunt, movie night, fire truck rides to name a few. The pool was clean and a decent size. They have three showers for the women and they were clean, but we didn't use them so it didn't matter. Everything was great we had a good time but, this is why I gave a 8 and not a 10. The rate is only for two people, we had two children with us and had to pay $5.00 per day for each child. Okay, that's fine but you have to pay for the crafts and the game room. I haven't stayed at many KOA's so maybe this is the norm, but I just thought I would mention the extra fees. We camped at Butler / Mohican KOA in a Motorhome. Arrived late and left early (in snow), so not much of a chance to evaluate the park. Off season use was self serve, which saved us a Wal-Mart dry camping night. We were able to arrange our stay by phone, when not much looked available. Site was a little soft, but I've seen (and sunk) in worse. We camped at Butler / Mohican KOA in a Motorhome. This campground feels like its near the middle of nowhere, if you like that sort of thing. It actually isn't too far out of Butler, in the heart of Amish country. You can see the horse and buggies occasionally go down the road. My only small complaint with this campground is the pull-through sites are a little small and the camp store did not have a lot: otherwise this is an enjoyable campground. Recently under new ownership, they are really trying to add more amenities to this place, although they already have the necessities. My kids had a great time with the heated pool, crafts, firetruck and wagon rides, and movie night. I'd recommend this place if you're looking to stay around the Mohican/Loudonville area where there is lots of biking, hiking and canoeing to do. We camped at Butler / Mohican KOA in a Travel Trailer. Way off the highway, but a pleasant campground. Nice, fairly level gravel sites with plenty of room. NO cable and you pay for Wi-Fi. Friendly staff. Lots of activities. We camped at Butler / Mohican KOA in a Motorhome. This park is way overpriced. I paid $65 a night for tent camping with no electricity or water! If you are going to camp with more than 2 people, be prepared to spend a small fortune. Stay at Mohican State Park for at least half of what it costs here. This last time I camped here, the staff was very rude and confrontational. One of the staff accused my group of sneaking into the campground and not paying to camp. Avoid this place: you too may be accused of being a thief! We camped at Butler / Mohican KOA in a Tent. We camped here over the Labor Day weekend. We had a full hookup site with 30A service, fairly large and nicely shaded. Our son and daughter-in-law joined us with their 2 daughters. 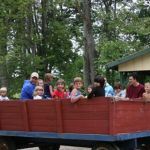 There were plenty of activities for the children, including a fire truck ride and wet hay ride (a tractor pulled a wagon loaded with children through the campsite while campers sprayed water or threw water balloons at them) which were greatly enjoyed. The hosts were very friendly and accommodating. The restrooms and showers were very clean the first 2 days, but could have used additional cleaning over the weekend when the camp ground was completely full. My son caught several fish at the catch and release pond. I was very impressed with the quietness of the campground especially considering that it was full. Will camp here again. We camped at Butler / Mohican KOA in a Tent Trailer. We stayed at Butler/Mohican KOA for the second time. We stayed once before in a motorhome in 2005. This time we stayed in a travel trailer. The sites are very big and our site was nicely shaded with lots of large, mature trees. The pool was fun, but very cold. They had a little ice cream social one night and a fire truck ride for the kids. We stayed there Father's Day weekend, but it wasn't busy at all. Once the sun went down, it was completely silent. We have stayed many other places that are actually louder after dark due to partying, but this wasn't one of those places. We enjoyed fishing in the lake, but didn't catch anything. There are several trails leading down the hill to the pool and store from the upper level, but beware, these don't appear to be trails made by the campground themselves, but rather made by a frequent flow of campers. So they are not cleared of plants necessarily, which we learned when our 7-year-old got poison ivy on her ankles. Our own fault though. So if you're very sensitive to poison ivy, stick to the actual drives through the campground! We will continue to go back to this campground due to the peacefulness and the fact that it's not a busy place. Also, the owners and other employees were so nice to us (family of 5 with 3 kids ages 7, 5, 1). They make sure rules are followed, but they're not breathing down your neck. Great place. We camped at Butler / Mohican KOA in a Travel Trailer. Are you affiliated with Butler / Mohican KOA ?